Will MoP Get More Alt-Friendly? I have fun raiding, acquiring gear and rep on my main, but I also had fun doing it on my alts. My main was always better geared than my alts, but that gap was much narrower than it is in Mists of Pandaria. While I understand the philosophy of how Blizzard is handling alts in MoP, I personally enjoyed my alts more in Wrath and Cataclysm. Now, I can barely log onto an alt because of the time it takes to grind reputation, farm (literally) and raid on my main, and the fact that I know I can’t level more than 30 minutes a week on any given alt. We’re not even talking about touching pet battle or going on transmog runs!! After 5 months in Cataclysm, I had 7 level 85s with about the same amount of playing time as I have today (6-10 hrs/week). After 5 months in MoP, I have one 90, and those other 6 alts are still sitting at 85 (disclosure, I RaF-boosted a Panda monk to 81 and leveled him to 85)…I haven’t been able to touch them. As someone with limited playing time, I long for the days that I could quickly gear up an alt and experience a raid from a caster or healer point of view (frost DK is my raiding main). However, it’s not keeping me from the game, or is it a major complaint, just a disappointment, really. I still thoroughly enjoy MoP on my main, as my “main dish,” but I miss all of the alt “sides” that I used to be able to enjoy. I personally would like to see an “alt leveling perk” system for every level 90 toon that you have. I’m not sure of the actual buff levels here, but maybe now that I have one 90, Blizzard could give me a permanent 25% leveling experience boost to all other toons on my account, and every additional 90 would boost my account an additional 5-10%. 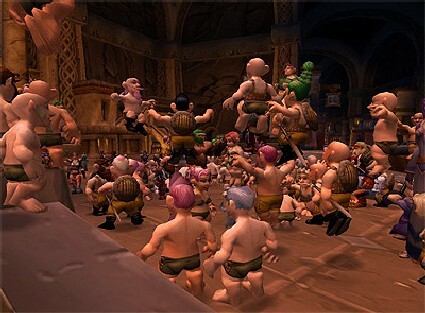 I would also like to see some of the reputation grinds lowered even more than it is currently (100% bonus to all server toons when you purchase a faction commendation at revered). I guess I’m a bit put off by doing even half of the same rep grind over again. I’ve been playing WoW continuously since October 2006, but I will never be that player that claims to have walked uphill in the fel-tainted snow both ways to the auction house, I don’t care if things are easier for the newer players! Do you like the way Blizzard has dealt with alts this expansion? Are you happy it’s not easier to level and gear up alts? Or, do you wish it was a bit easier to level and gear alts because that’s what you enjoy? Could Blizzard award leveling speed perks to alts for every 90 you have? Recruit a friend and dual boxing = instant level 80 panda monk! I took the summer off with the kiddos, but now I’m back for more Epic Diaper segments. I’m a bit of an altoholic, and as of today, I have 7 level 85s and 3 level 81s, all 10 slots are full. Before 5.0.4, I assumed that we wouldn’t get that 11th character slot until MoP drops on September 25. However, Blizzard surprised me in giving us that 11th slot in patch 5.0.4!! What did that mean for me? Well, another alt! But, wait, I have one of every class, and monks aren’t available until MoP, so what would I put there?! Good question, Mr. third party brain!! Why, I do WANT a panda monk, afterall, and there’s a way I can get a level 80 panda monk within hours of MoP launching. You cannot boost a panda monk with the Scroll of Resurrection, unfortunately, but Blizzard has been clear about allowing you to grant levels from Recruit a Friend! So, it’s a bit tricky, but this is what I’m currently doing: I bought the WoW Battlechest and Wrath for $5 each during the August sale on Blizzard’s site. $10. Now, I emailed myself the RAF code and established the new account on my Battle.net account, which starts the clock for the 90 day duration of benefits (summoning, triple xp, etc.). I then created 2 blood elf mages, and equipped BOTH of them with a full caster dps heirloom set (yes, I spent the justice points and gold on a second set). The reason is that heirloom XP boosts (a total of 35%) STACKS with the 300% RAF boost for a total of 335%!!! I plan on leveling this first pair of mages to 80, then deleting the mage from my veteran account, as she takes up that 11th character slot, and I need a new team. The referred account mage now has 40 levels to grant my panda monk (you get 1 level to grant for every 2 levels you gain). But that’s not enough. So, I will level a SECOND pair of mages to 40, so the referred account now has 20 levels to grant, and then I’ll level a third pair of mages to level 20, so the referred account has 10 levels to grants! That’s 70 levels total, why not 80? Well, when you create a panda (and I’m creating a panda monk), you need to level through the starting zone to the point where you choose a faction, which is at level 10. You can’t grant a panda monk levels before that, as stated by Blizzard. That’s fine, I want to see the starting zone anyway! 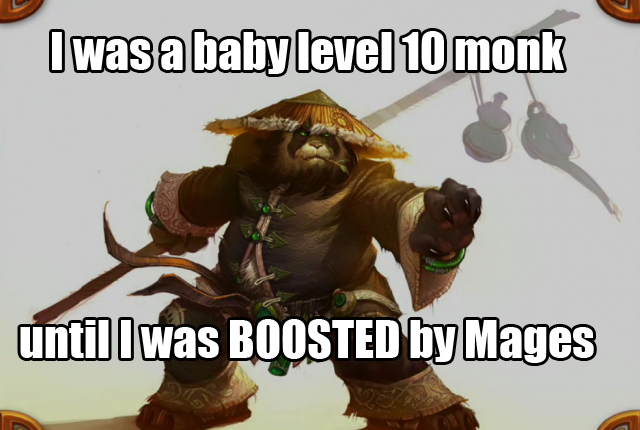 Once MoP drops, I’ll level that Kung-fu panda to 10, then have my level 20 mage summon him to Orgrimmar to grant him 10 levels to level 20. Then I will log on the level 40 mage, grant the panda 20 levels to level 40, and finally, log on with my level 80 mage and grant him 40 levels to level 80.9999! Note: make sure you have your boosted character at a bubble shy of the next level. This way, he/she will be one bubble away from level 81 and save you an hour or two of leveling in Cata content.